The paintings of contemporary artist Lyudmila Agrich will transport you. Suddenly you’re caught in the bustle of Times Square; you’re strolling down a Parisian boulevard enjoying the sunset; you’re quietly contemplating the colorful reflections of a lily pond. You feel the movement surrounding you. 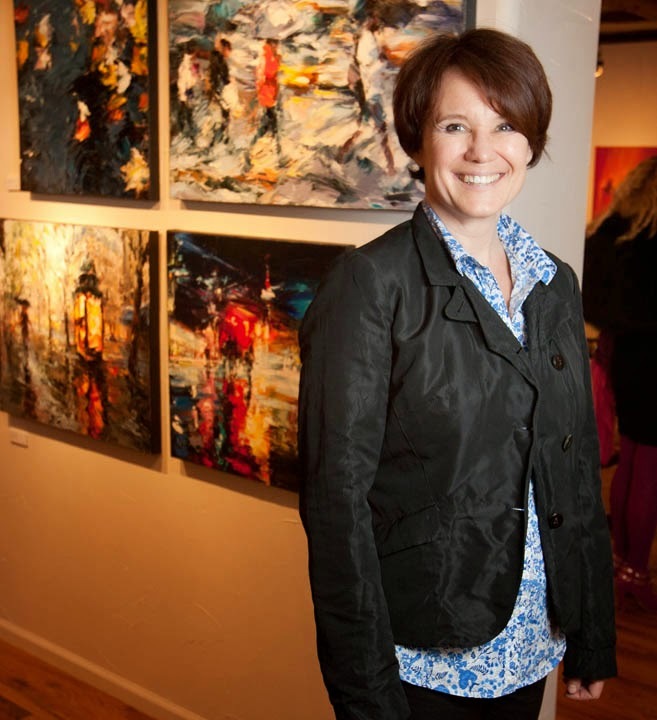 On Friday, May 8, Agrich includes her fellow Coloradoans in her visual travels when she brings her newest collection of luminous oil paintings, ‘Rhythm,’ to Mirada Fine Art. The rich glow of each Agrich creation is a hallmark of the artist. Applying oil paint with a palette knife instead of a brush allows her to truly capture the underlying motion, and emotion, of a scene. She refers to the canvases as ‘a visual diary.’ The radiance of her work demonstrates how light and texture can alter both our perceptions and our mood. “Every painting is unique and reflects a part of me, but somehow appeals universally to others,” Agrich states. Born in Russia, Lyudmila spent much of her childhood in the seaside city of Odessa. The ever-changing nature of the light there, combined with years spent in a Fine Arts school for children, influenced her to pursue an art career. Ms. Agrich earned a Bachelor’s degree in Architecture and Fine Arts in Russia and upon graduating started practicing Architecture in the Ukraine. She continued her practice after moving to the United States in 1992, ultimately settling in Denver. In 2001 she put aside the drafting board to take up canvases and easels full-time. Frustrated by the restrictions of a paintbrush, she replaced that tool with a palette knife, believing it best portrays her bright, beautiful images. A reception with Lyudmila Agrich will be held on Friday, May 8 from 6-9pm at Mirada Fine Art Gallery. The exhibition will run through May 31st. Oil on Canvas, 36 x 60"